Several folks have asked what the birds do all day long. We thought an explanation about our companionable and ever entertaining pets would give you a better understanding. Nate and Primo are Yellow Naped Amazon Parrots. Their day starts around 7 AM, about the time the Admiral rises. They will have preened themselves completely by this time while in their large separate cages located in the guest stateroom in the upper bunk. Once brought out on their t-stand in the saloon, a variety of toys are offered, depending upon their mood. If they feel like chewing, cardboard, wood sticks, and rubber rings are available. Three toys are all time favorites. The first is a blue rubber ball with a bell inside. This rubber ball not only satisfies their chewing desire but usually evolves into a game of toss and fetch. They have us well trained on the fetch portion of the game. They can toss the ball across the entire saloon if they want. Mater, a Tonka Toy based on a character in the Pixar Movie “Cars” is a second favorite, especially for Nate. Both birds will chew on and push Mater off the table edge. Once again, they have us trained to retrieve Mater back to the table top. The third favorite is a large brown paper bag. 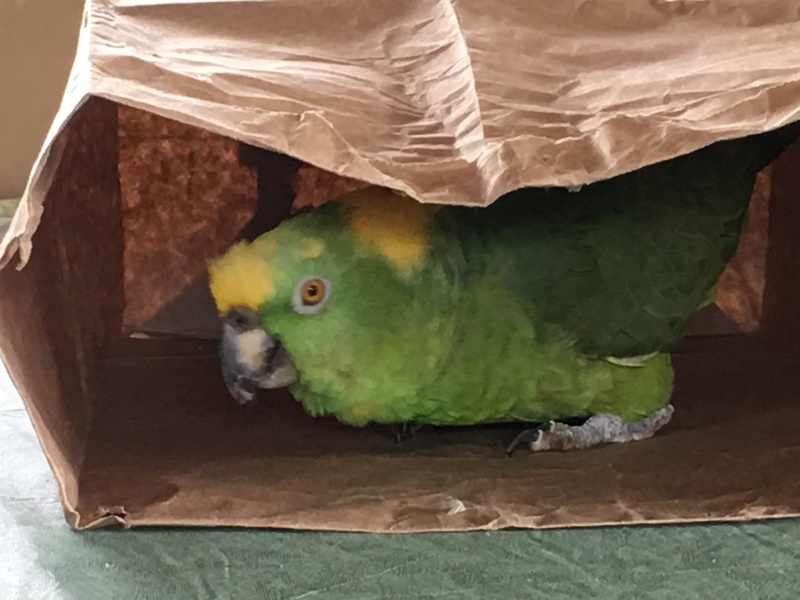 It provides both birds with hours of entertainment disappearing into the bag. Both birds take turns exploring the big interior and sometimes chew out a back corner to peek out of. Naps in the afternoon are required after a full morning of chewing and playing. Depending on the temperature, both birds will shower weekly on the back deck. Food preparation in the early PM by the Admiral is closely supervised by Nate and Primo. Both want to see what’s for dinner. Nate and Primo get a nutritionally balanced parrot pellet and fresh water every day. A third bowl contains a variety of fresh fruit, vegetables, and “people” food. Pasta, rice, potato in small quantities along with scrambled eggs and protein are offered on a rotating basis. A hanging kabob with firmer food items provides additional mental stimulation during meal times. Since they are not as active as their wild kin, we have to watch their weight so they do not become overweight, just as with humans. After their meal in their cage, both birds will come back out to the saloon table for the evening. Preening, grooming, and petting by us are favorite things for them to do. Both are usually ready for bed at 9 PM. Susie has had Nate for 40 years. She got him when he was less than a year old. 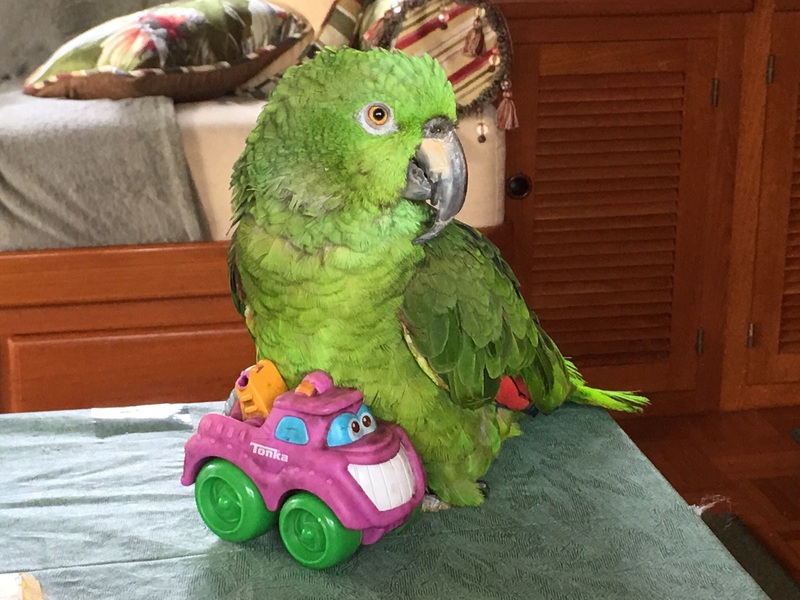 Primo came into our lives in 2016 when he was given up for adoption by his owner of 35 years after this gentleman moved into Hospice and couldn’t care for Primo any longer. Both birds have become fast friends and are almost inseparable. But just like all brothers, squabbles sometimes break out and they both need some time out. And just like close brothers, these minor disputes are quickly forgotten. Intense curiosity about life around them, variety of mental/physical stimulations, avoidance of boredom and plenty of downtime in their own spacious cages are part of daily life. It’s like living with two three year old boys who never grow up. Both birds are quite vocal and say a variety of words. “ I can talk, can you fly?”, “ I love Susie” and “Hello” ( delivered with a degree of emphasis) are a few examples of their verbal repertoire. They can communicate their moods and desires very well through a variety of words, calls, yells, squeaks, growls, and chuckles. Vocal trilling and feather flailing accompanied with eye pupil pinning also are ways they communicate their moods to us and each other. They are not shy about letting us know their wants and desires. They are however, very wary of strangers and can easily recognize people they have made friends with before. Nate and Primo’s memories are quite excellent and extensive. Their eyesight is likewise excellent and they miss nothing in their environment. Hearing is also very good with every strange noise quickly noted with alarm. Their anvil shaped tongue provides sensory detection of every sort and combined with an incredibly dexterous beak and feet, they can quickly undo latches and secured objects. Their beak can be quite destructive if left unsupervised. 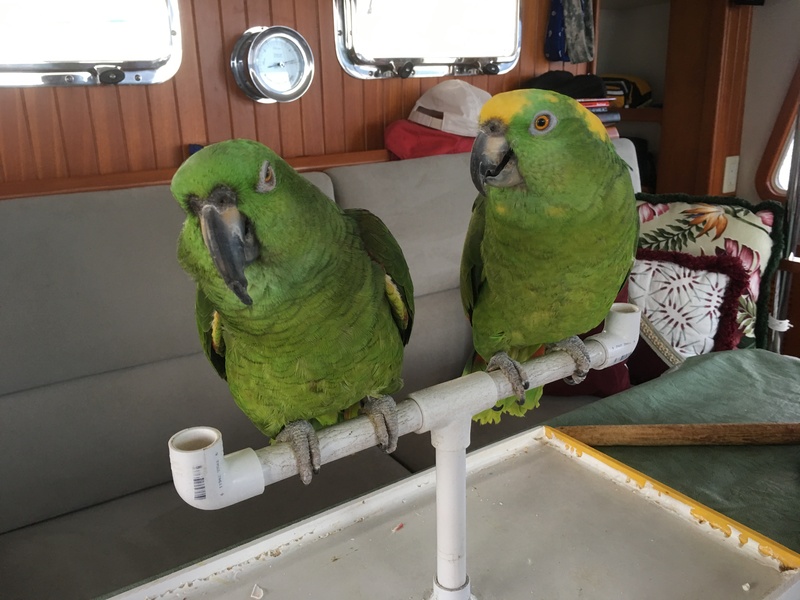 Nate and Primo have become quite accustomed to travel between the boat and our home in Tennessee. 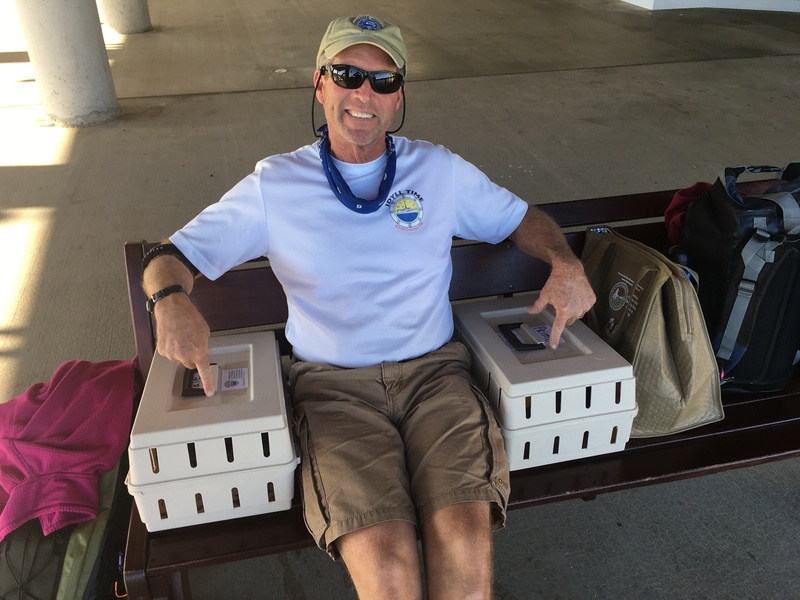 They have “ big” cages at both locations and “travel” cages for road trips in the Winnebago RV. They even have travel “boxes” for feet trips and short car rides. Both birds visit the vet twice a year for health inspections and trimming of their beaks, wings, and nails. Their primary flight muscles are not used as they would be in the wild but a few long wing feathers are shortened just in case of “ lift off”. Beaks and nails are trimmed they too are not worn down as in the outside world. 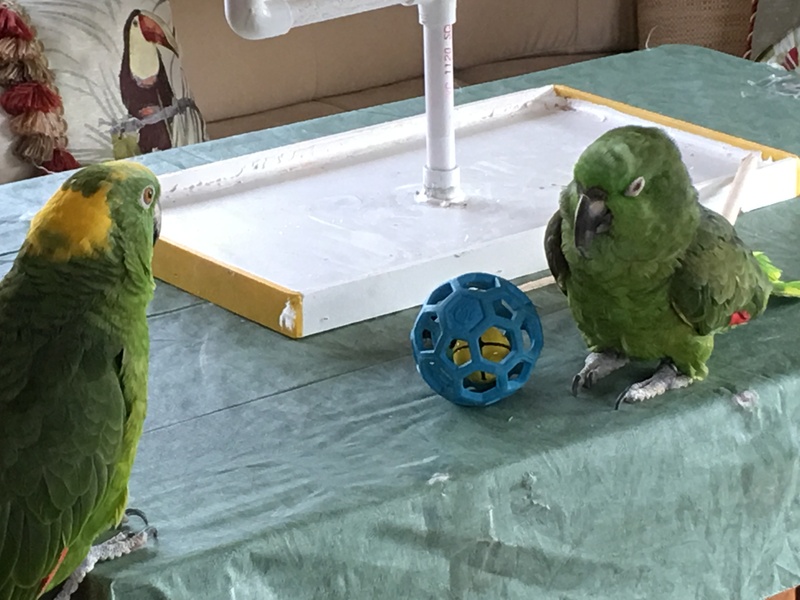 Overall, living with these two green feathered creatures is never boring or lonely. Besides, we don’t have to take them ashore or outside several times a day as with a dog or clean the cat litter box. A few pieces of newspaper in the bottom of the cage is all that is needed. 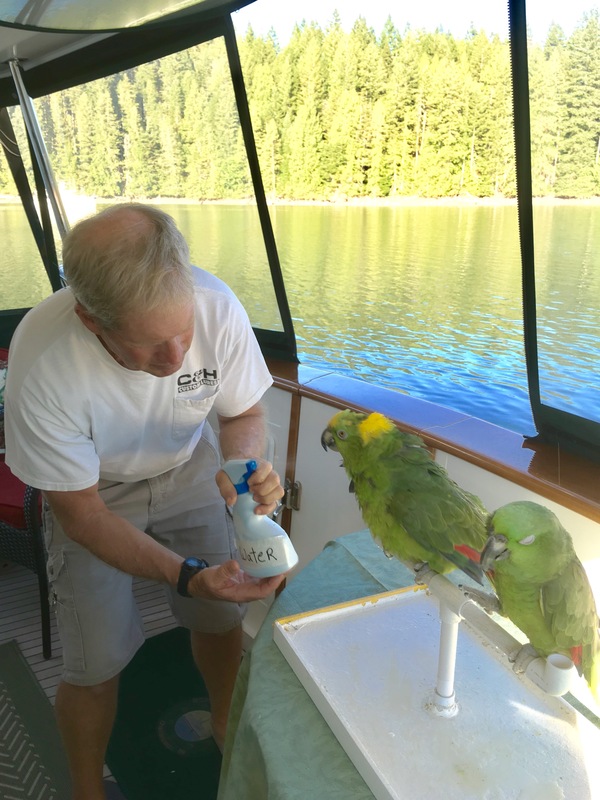 Nate and Primo are a lifetime commitment as parrots can live up to 80 years. 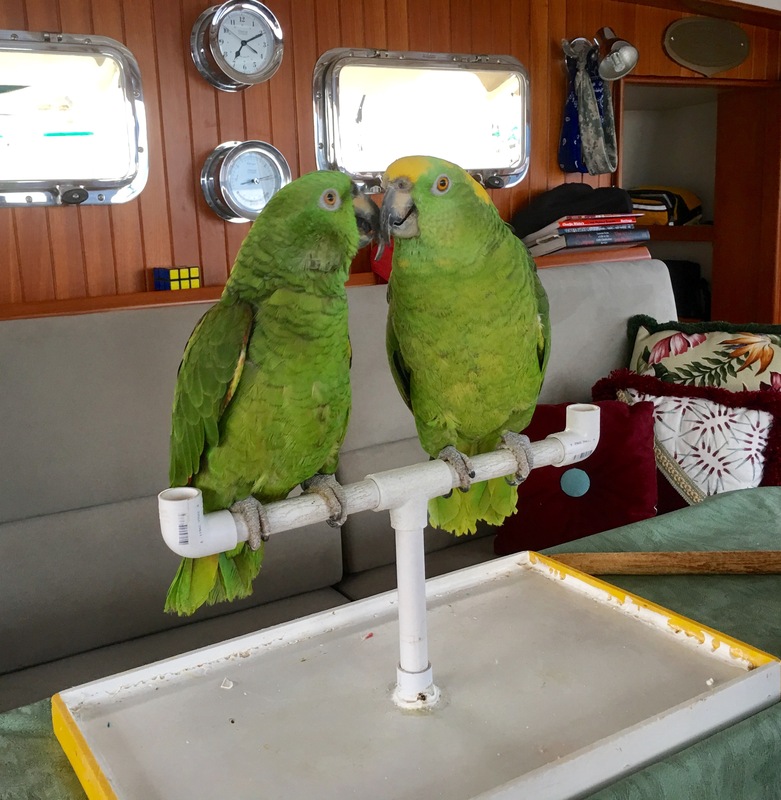 We look forward to many more years of cruising with these two feathered friends. This entry was posted on September 11, 2017 at 10:59 pm. You can follow any responses to this entry through the RSS 2.0 feed. You can leave a response, or trackback from your own site.